This image shows the southern edge of a large basin called Cerberus Palus, located in Elysium Planitia near Mars' equator. The Northern (top) half of the image depicts a small portion of a regionally extensive lava flow that ponded in Cerberus Palus. Where the surface texture of the lava is rough and ridged, the solidified flow-top crumpled and broke while the lava flow was still moving. Where the surface is smoother, it suffered less deformation prior to solidification of the lava flow. Two distinct types of terrain dominate the southern (bottom) half of this image. The terrain to the west (left) consists of ejecta from an impact crater that predates the lava flow. Where this older ejecta blanket meets the lava near the middle of the image, the latter laps onto the former. The terrain to the east (right) is more enigmatic. It consists of a high-standing plateau fractured into large, often tilted blocks. 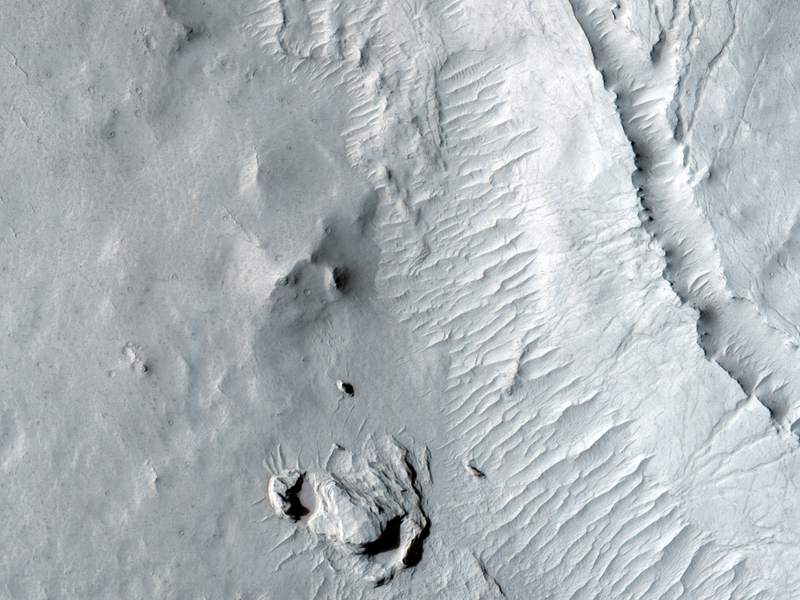 Along its northern margin (near the center of the image), this plateau-forming material appears to overprint the lava, and in the south-central part of the image, a tongue of lava emerges from underneath the fractured plateau. Two explanations are possible: either the lava flow was "invasive," in that it burrowed under less dense material, or the plateau-forming material is even younger than the lava, which is known to have formed during the youngest period in Mars' geologic history, the Late Amazonian.